The rain of the last few days has been prolific. 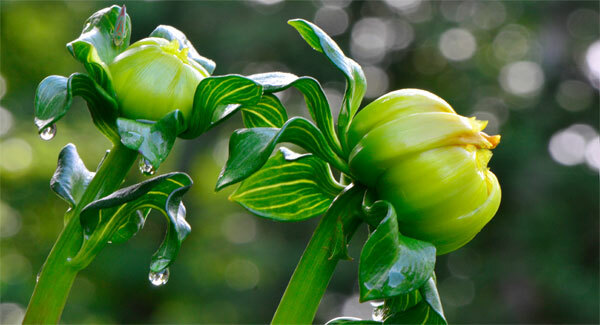 If you are lucky enough to find a late bloom, keep it close, they’re becoming limited in supply. Only the hardy ones survive end of season craziness. Dahlias are some of those hardy survivors. 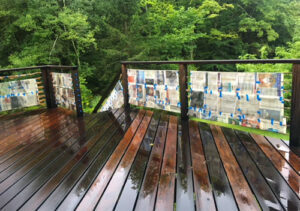 We spent many hours taping off our decks to apply their annual stain and suddenly the heavens opened. We’ll see if the newspaper holds the next few days it’ll take before the deck dries out again. The garden is full of wooly green bushes and plants coming down the home stretch of the growing season. I love this time of year. There’s so much change in the air and anticipation of seasons to come. And New England color! This weekend a friend and I are tagging along with a family of sisters to a showing of our old favorite, “The Sound of Music.” It’s terribly romantic and having grown up with six sisters, the gang of kids in the film and their connection to the convent are very familiar. Romance can be a good thing! And how cool is this? 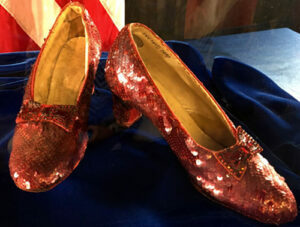 Thirteen years ago, one of the original pairs of ruby slippers worn by Judy Garland in “The Wizard of OZ, were stolen from the Grand Rapids Michigan, Judy Garland Museum. They were found again in September of this year. In L Frank Baum’s original book, the shoes were originally supposed to be silver. The color red was introduced to dramatize the still rare use of color cinematography in 1939 when the film was made. Remember the scene when Dorothy walks out of her house into the beautifully colored Land of Oz? For me, the use of color is a primary driver in my artwork. That and the use of light. Colors mark different times of year and rituals the world over. I’ve almost finished a new holiday scarf. Blues and a new take on red striped candy canes, part of countless children’s lives growing up. Those memories are triggered by color and its use in the visual world. What do you think? Dreams can be a positive part of life. Dreams was one of the Cranberries big hits-written by lead singer, Dolores, O’Riordan. The Irish alternative band’s lead singer/songwriter was diagnosed as having a bipolar mental health condition and much later found to have died accidentally while soaking in a hot bath in her hotel room. O’Riordan had four times the legal blood alcohol limit. More about Dolores’s passing. Paola Prints has awesome all cotton, all American-made pillows and scarves for sale. See our pillow inventory here. 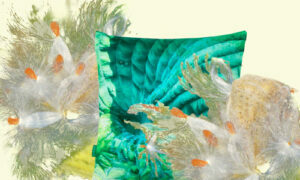 See our scarf designs here. Pillow covers and scarves are only available direct through me. Commission work is also available direct. Reach out to me here!